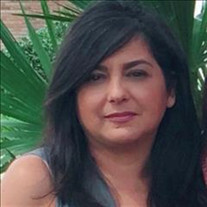 Iliana Mercedes Underwood, 55 of Jacksonville, Florida passed away on Monday, July 9, 2018. Arrangements under the care of Naugle Funeral Home 1203 Hendricks Avenue Jacksonville, Florida 32207 (904)396-1611. The family of Iliana Mercedes Underwood created this Life Tributes page to make it easy to share your memories. Send flowers to the Underwood's family.